You might have your frozen lattes, your coffee slushes or your simple iced coffe e. For me, nothing compares to the Greek Frappé. In fact, when I looked at where I had spent many of my euros on a recent trip to Greece, it was a little scary how much went to these frothy summer drinks. What's even scarier is that it's not like they are made with the most sought-after coffee beans in the world or anything. In fact, the "coffee" part of the drink is actually instant coffee. Before you go to "x" out of this page, stay with me. 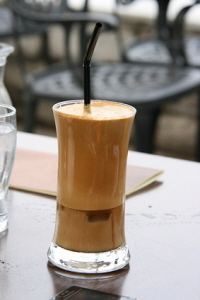 The drink, which has become known as the unofficial national coffee of Greece, was accidentally "discovered" back in 1957 at the International Trade Show in Thessaloniki. Apparently, a representative from the Nestlé company was introducing a new shake-and-drink chocolate milk product for kids. At the time, he could not find any hot water so he mixed a couple of scoops of his freeze-dried coffee with cold water in a shaker and...the Greek Frappé was born. Since then, the drink has become so popular, it's available in virtually all cafes in Greece and Cyprus and has spread to other countries. Of course, it tastes better in the context of being in Greece, people-watching in a café on the sea. But, when Connecticut summers can be as hot as Crete, I am perfectly content shaking up one of my own at home. Here's all it takes. Place ingredients in a cocktail shaker. Shake ambitiously for about 30 seconds. Pour into a glass and add ice cubes. Serve with a straw. The straw is used to mix the ingredients and produce the sound of ice cubes hitting the glass, which is an important part of the experience of drinking a frappé.